If you want to perform work as a contractor in the state of Tennessee you will likely need to get licensed. There are numerous different types of contractor licenses in Tennessee, both on a state and on a county level. Whether you need to get licensed will depend on the type of work you want to perform, as well as on where you are located. 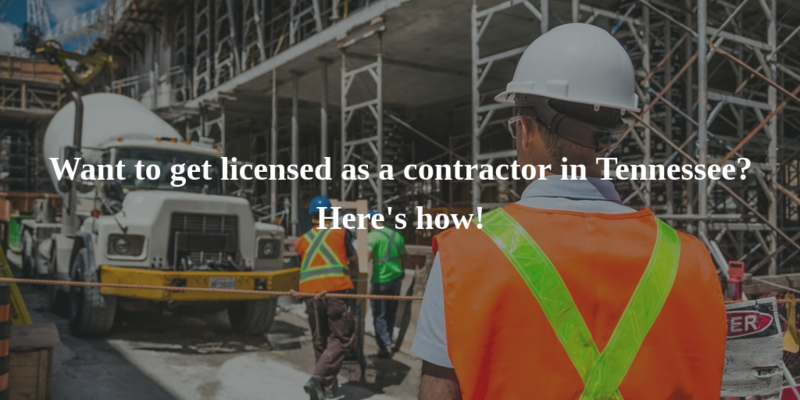 Read on for an overview of how to get a Tennessee contractor license, the different license types, and when you will need to get a contractor license bond. The above applies to both general (prime) contractors as well as subcontractors on all projects above $25,000. Unlike the licenses required for projects over $25,000, these are not required equally in all counties in Tennessee. A majority of counties in the state require the LLE and LLP licenses, while only the counties of Bradley, Davidson, Hamilton, Haywood, Knox, Marion, Robertson, Rutherford, and Shelby currently require the home improvement contractor license. A number of cities and counties, such as Memphis and the county of Shelby, and the cities of Knoxville, Nashville, and Johnson, issue so-called local licenses (or permits). These are different from the LLE/LLP licenses, and the latter may not be accepted in these jurisdictions if they do not conform to local codes. Apart from the home improvement license, Shelby County also issues building, electrical, mechanical & gas, plumbing, and sign licenses. The cities of Knoxville and Johnson issue local licenses in similar categories. To obtain any of these many licenses, whether from the State Board or from a local licensing body, applicants will be asked to complete a number of licensing requirements. Read on for a breakdown of these requirements. Apply for your contractor license bond today! Why us? The above steps apply only to licenses on projects above $25,000. The whole process is described in full detail, along with all necessary forms, on the State Board’s website. The licensing process for limited licenses and for the home improvement license involves fewer requirements though it also includes an examination. Those who need to apply for a local license/permit such as the ones required in Memphis and Shelby County or the cities of Knoxville and Johnson will need to pass through similar steps (with the exception of submitting a financial statement), only on a local level. Due to the difference in some requirements, if you need to apply for a license in one of these locations it is best to either consult the county/city website or contact the local licensing divisions. An important part of the licensing process for many contractors in Tennessee is the contractor license bond. See below for an overview of the cases in which a bond must be obtained by license applicants. The surety bond requirement for contractors in Tennessee applies only to a number of license types. While general contractors and subcontractors licensed at the State Board do not require a surety bond when applying for a license, in certain very specific cases the Board may request such applicants to provide a bond. A bond may be requested of such contractors who are owned by another entity. Depending on the situation, the Board may request the parent company to provide it with a guaranty agreement as a form of indemnity. If the parent company is unable to provide the Board with such an agreement, the Board may require it to post a contractor’s license bond as a type of security and to guarantee for the monetary limit requested by the contractor. These types of bonds are either in the amount of $500,000 or $1,000,000. Apart from the very specific case above, a number of other contractors must always post a bond when applying for a license at the Board. Under Public Chapter 460, Title 62, chapter 6, Section 506 of Tennessee Code Annotated, home improvement contractors in the state must post a $10,000 bond when applying for a license. This bond is to serve as protection to claimants in cases in which the home improvement contractor has breached a contract and has caused damages and losses in doing so. The cost of your bond is a percentage of the total amount of the bond you are required to obtain. This percentage is determined by your surety when you apply for a bond and is mostly based on your personal credit score. If you want to know how much your bond might cost, submit a surety bond application, and we will provide you with a free quote on your bond with no obligations attached!